Greg is away this evening, having dinner with a friend. And therefore, I decided to make this dish that I created and love and that he considers, actually, to be the Side Dish From Hell. His three least favorite foods are onions, peppers and green beans, so even the addition of a scrumptious sauce and bacon could not turn his head. It would turn his stomach, but not his head. Greg worked many summers as a kid in Oregon either picking green beans or in a bean cannery and he has vowed, and I respect this, never to eat another green bean again. Onions and peppers, according to him, have an “icky, slimy” texture and are also to be avoided. So while Greg is gone, and won’t have to even look…I made my own Dream Dinner to Eat in Bed, while snuggled in my PJs. 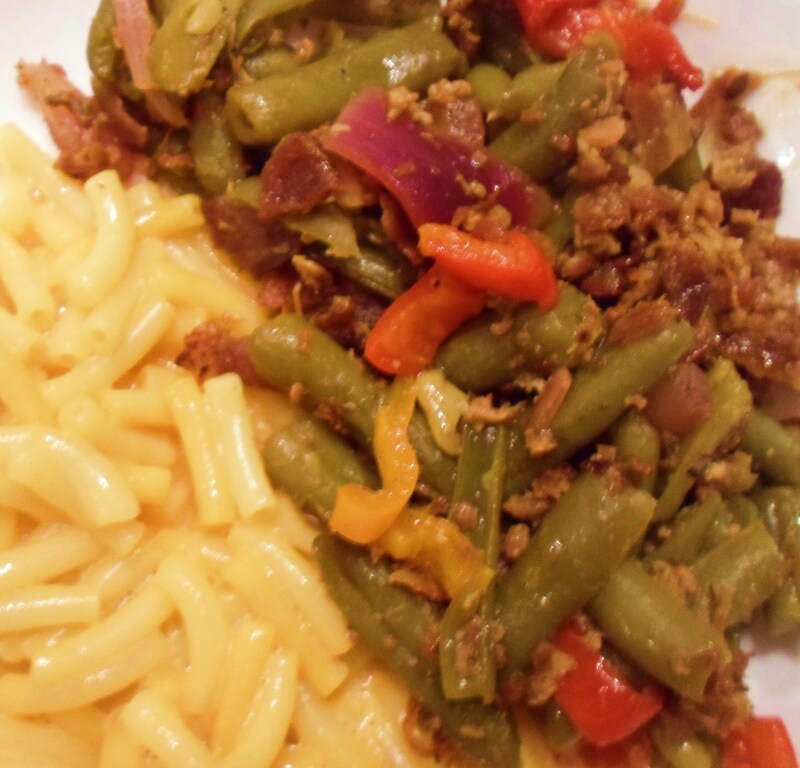 Tonight’s dream meal is made of this sweet and savory green bean dish, below, loaded with sautéed onions and sweet peppers, with a side of (I know, it’s bad, but try not to groan) boxed Kraft macaroni and cheese. Served with a spoon in a big flat pasta bowl. With a glass of ice cold milk in a frosty-frozen mug. And a cozy blankey tucked around my feet. While I watch non-action-related shows like Parenthood and Oprah’s Next Chapter, TV my husband enjoys about as much as green beans. Of course, I miss my man, as I do adore him. But in the meantime, I’m soldiering on the best I can, a bowl in one hand, remote in the other. *Vegans can use a vegetarian bacon bits product instead or use sliced almonds that have been sauteed in smoked paprika and a little olive oil instead. 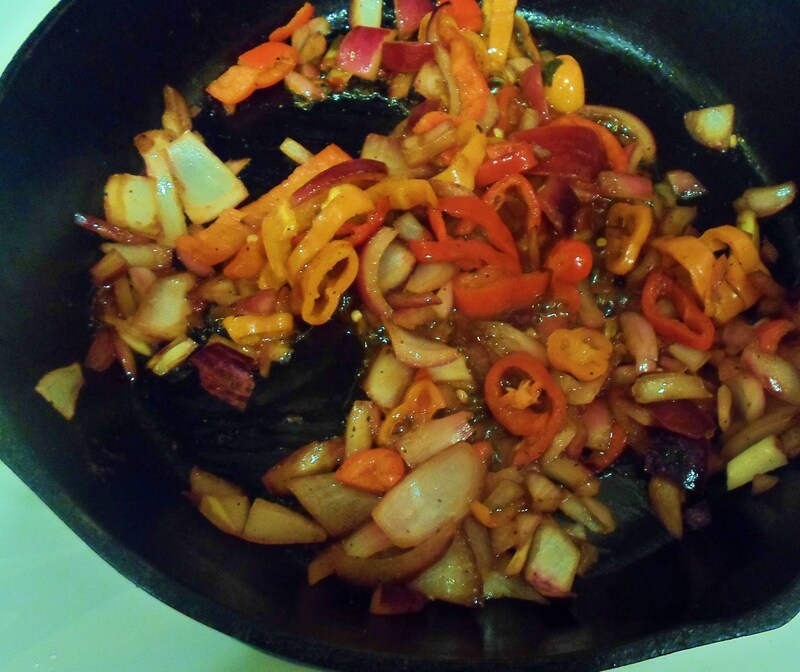 In an oven-proof skillet saute onions and peppers in olive oil. Add the Thai sweet chili sauce, red wine vinegar and brown sugar. Cook and stir all together until it is syrupy. Add well drained green beans and stir once again until well heated. Add salt and pepper to taste. 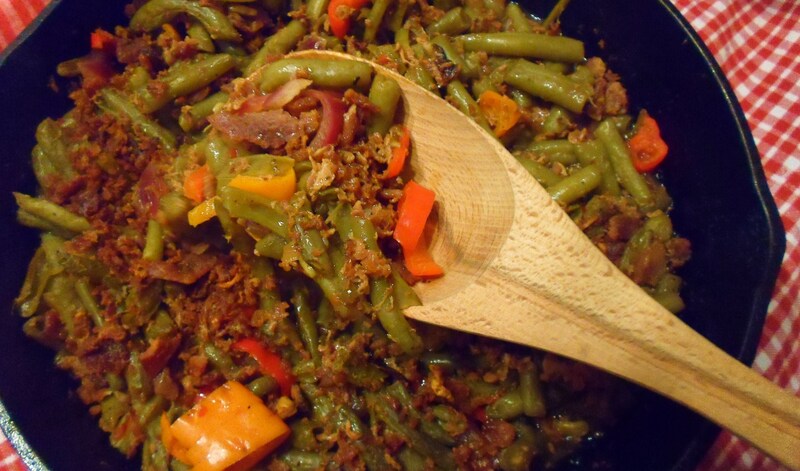 (This will vary quite a bit depending on whether you used canned or fresh or frozen green beans.) Sprinkle the top with bacon crumbles and put pan under broiler for a minute or two until bacon is crisp and beans are bubbling. 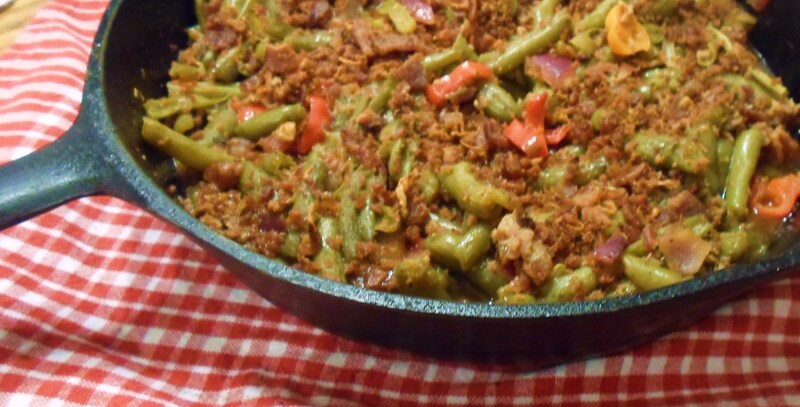 Serve as a side dish (a nice alternative for a Thanksgiving green bean casserole) curl up with a bowl of it, while lounging in your PJs. When my daughter Rachel was a little girl, I asked her, “What would you rather be when you grow up, a doctor or a nurse?” I wanted her to know she would not be bound by gender rules, that she could be anything she wanted to be as an adult. Rachel and I laugh that the way to get food re-pinned on Pinterest is to put a slice of avocado on it. 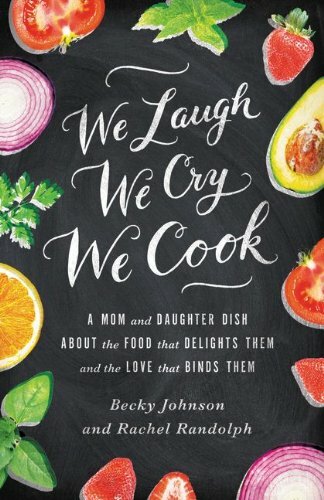 We’ve debated about putting a piece of avocado on everything we make, from desserts to cocktails, as our “signature garnish.” Because, let me tell you, people love the sight of a green, ripe avocado in food pictures! Thus, using those guidelines, this salad was born. 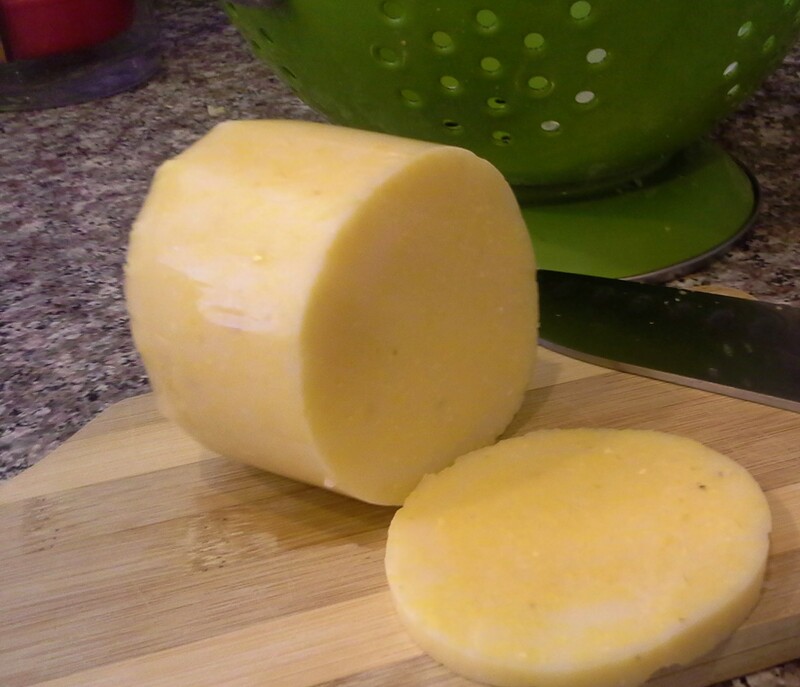 At the end of groceries I had one meat protein left in the fridge: natural, nitrate-free bacon. 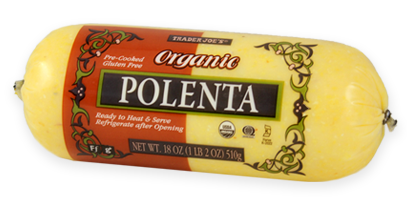 (Though I’m shifting toward vegetarianism, my husband is staying put in the land of meat for now, so I try to buy the least processed, organic varieties.) I thought about a BLT sandwich, but our waistlines are calling for more vegies and less bread. Ah-ha! 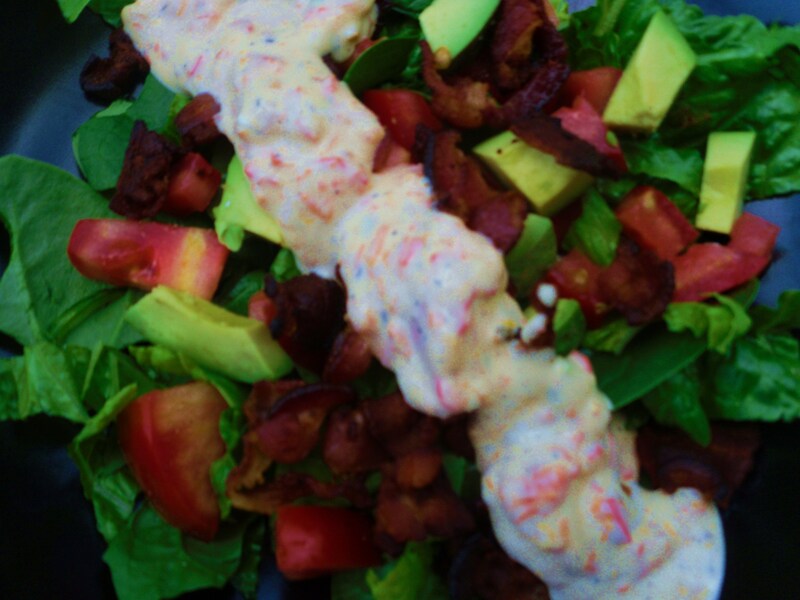 A BLT salad! Then I spied some of those little sweet red and yellow peppers in the crisper. With a roasted pepper dressing! Yes! I pulled out a little of the leftover cornbread in the back of the fridge, spread with butter and broiled until crispy, like a giant cornbread crouton. Ta-dah. Dinner done. Needless to say, it worked. We WILL be having this salad again. Vegetarians and Vegans: There are lots of bacon bits that are great for vegans and vegetarians. McCormicks makes a tasty brand and is easy to find at most any grocery store. 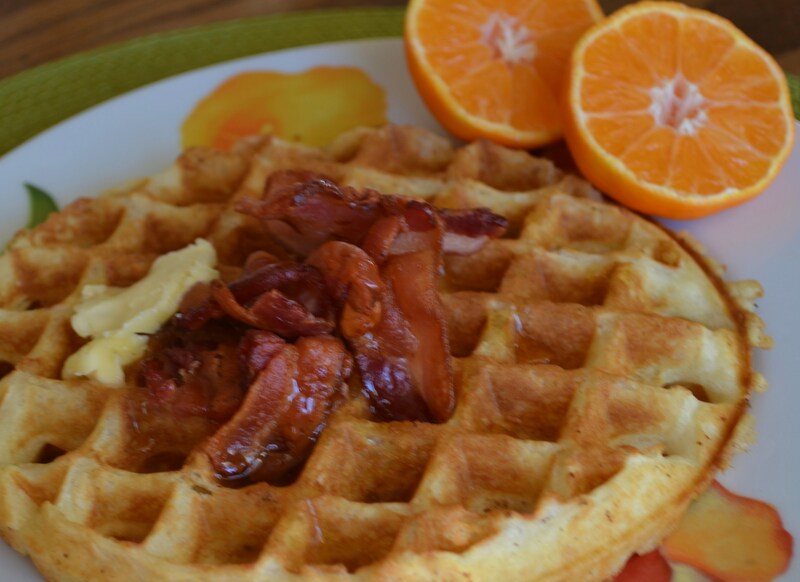 Cook the cut up bacon over medium high heat in a skillet until the pieces are golden crisp and brown. Drain on paper towels. 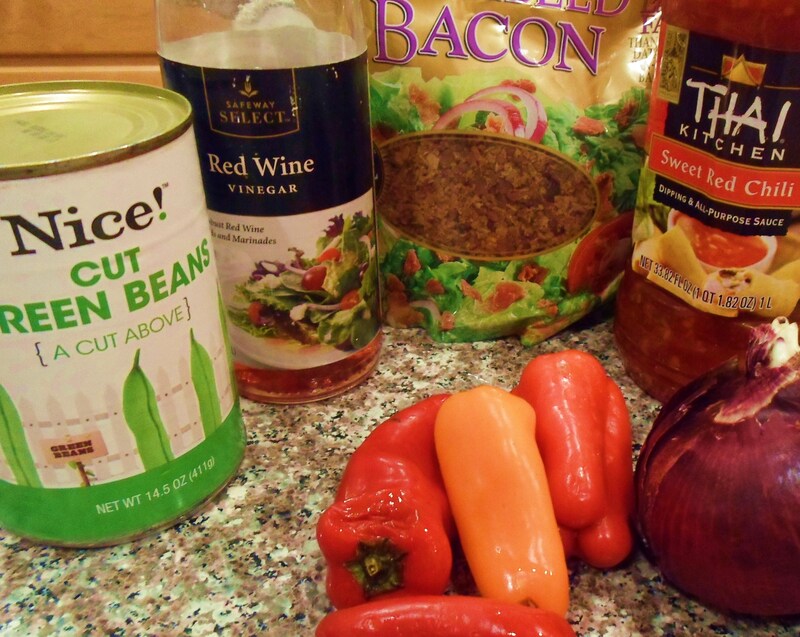 While bacon is cooking, roast the peppers over a gas flame or under the broiler. 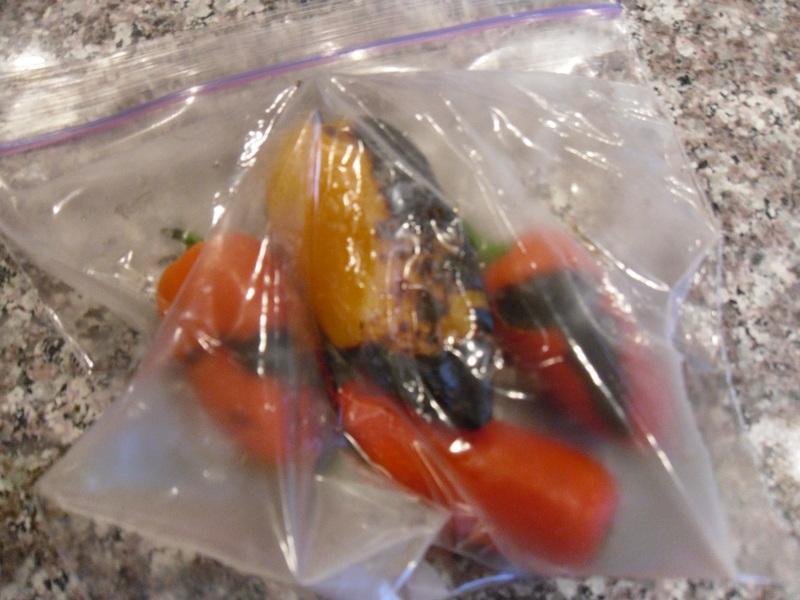 Put them in a plastic bag when they have a good char all around so the steam will loosen the skin. 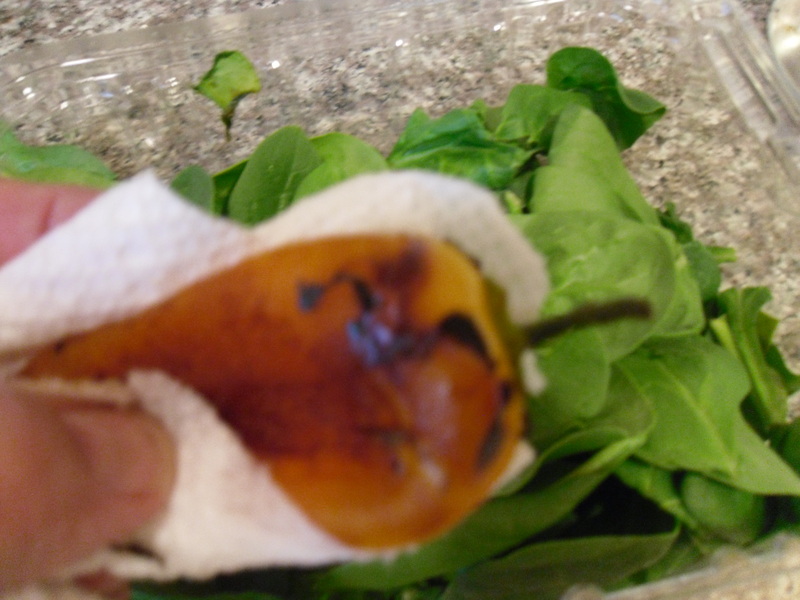 Wipe the charred pepper skin off with a paper towel. Wiping away the charred skin with paper towel. Don’t worry about getting all char off of the peppers. Some of it adds flavor. Into each of two large salad bowls (I like big pasta bowls for this), put one cup of mixed salad greens. 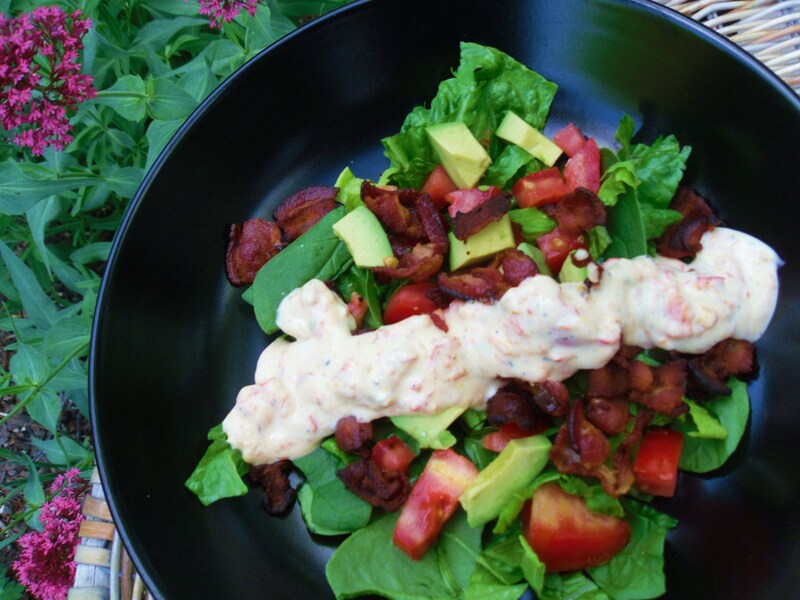 Sprinkle each salad with half the tomatoes and avocados. 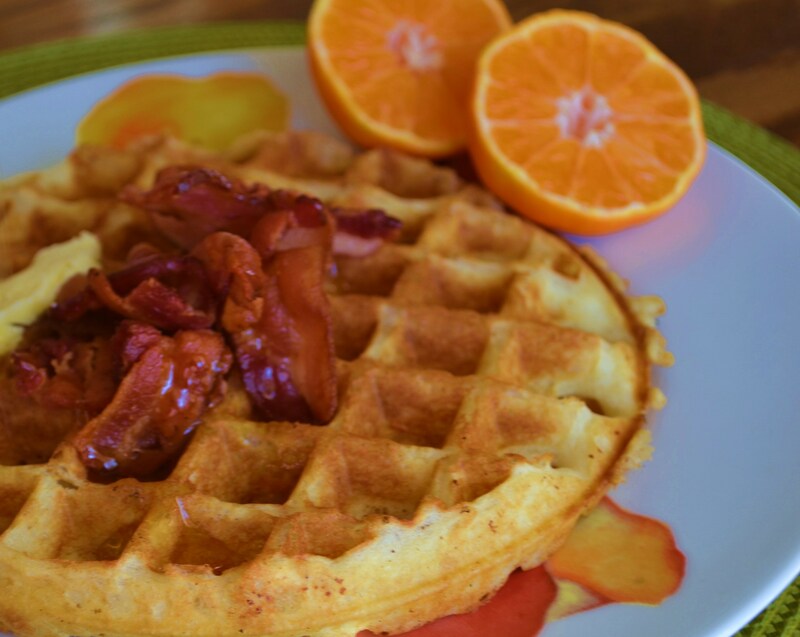 Top with crispy bacon or bacon bits. Put Ranch Dressing and roasted pepper into a food processor or blender. Blend to desired consistency. I left the peppers a little bit chunky. Ladle dressing down the middle of the salads and serve. A few turns of fresh pepper are nice. 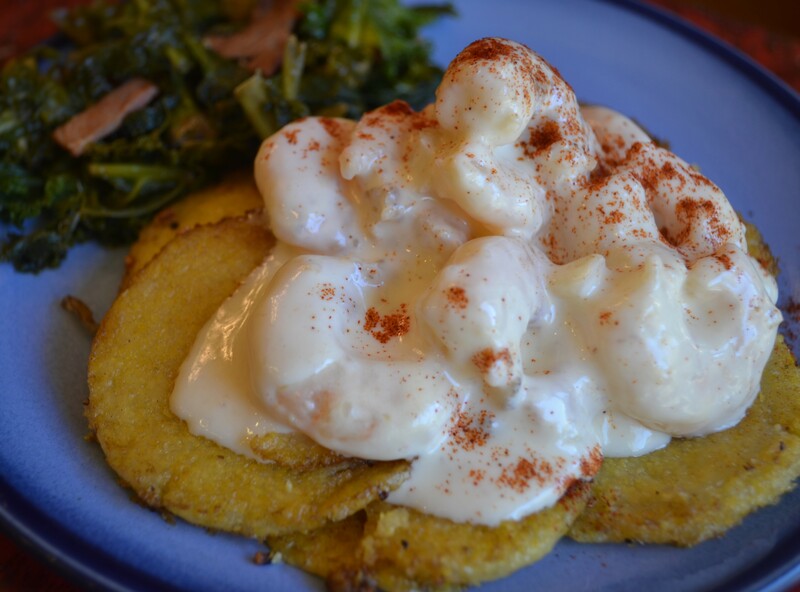 This is especially good with cornbread on the side. Variations: Additional yummy add-ins could be thinly sliced red onion or chopped green onion, corn, beans, or a diced boiled egg. I’m on the sixth day of this schedule and I can tell you the world seems brighter, my heart seems happier and people, in general, of all shapes and sizes and ages seem especially adorable. I think I may have discovered the cure for world peace. Yesterday at the pool, with some sort of soft jazz playing in the background I looked up into a blue cloudless sky and, I kid you not, someone was sky-writing, “God loves you. Jesus forgives you.” I started wondering if perhaps I had stepped into the Christian version of the Truman Show. But I’m going with it. I have come to the conlusion that the cure for World Peace is for all of us to be on perpetual vacation. Well, that, and bacon. 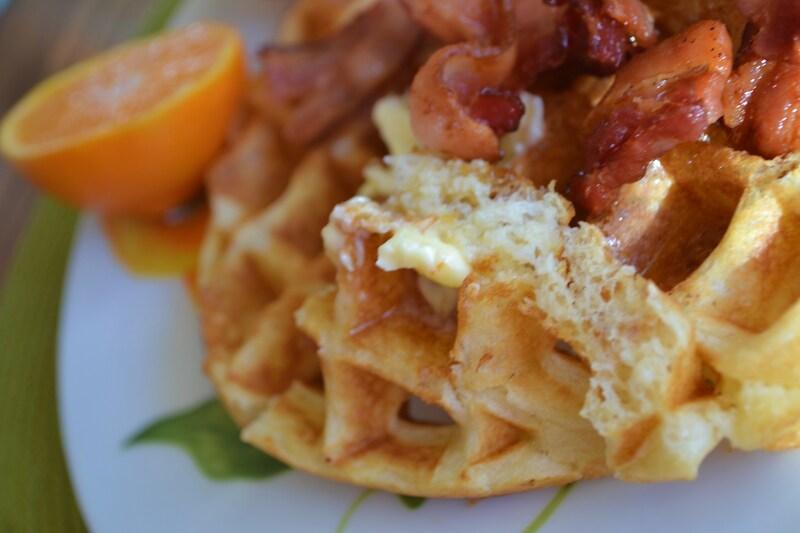 I cooked up a mess of bacon from the remaining contents of our condo fridge this morning. Bacon alone makes my normally laid-back husband want to dance me around the kitchen. But I needed to make something lunch-worthy out of it. I spied an apple. Lettuce. Italian Dressing. Brown Sugar. Voila! 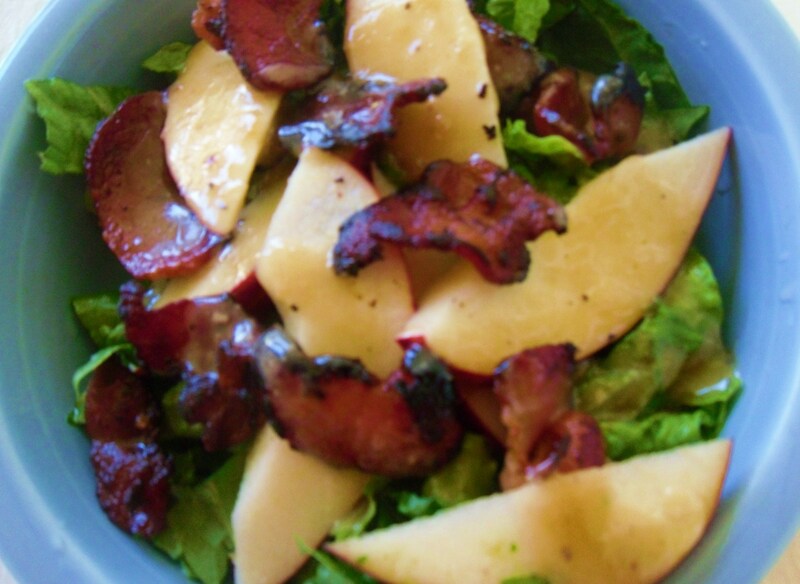 Bacon Apple Salad with Brown Sugar Dressing. Seriously, how could this not be amazing? Let me assure you it is! Divide lettuce into two salad bowls. Arrange apple slices over each. Top with crumbled bacon, dividing evenly. In small skillet put 1 t. bacon drippings, Italian dressing and 1 T. brown sugar. 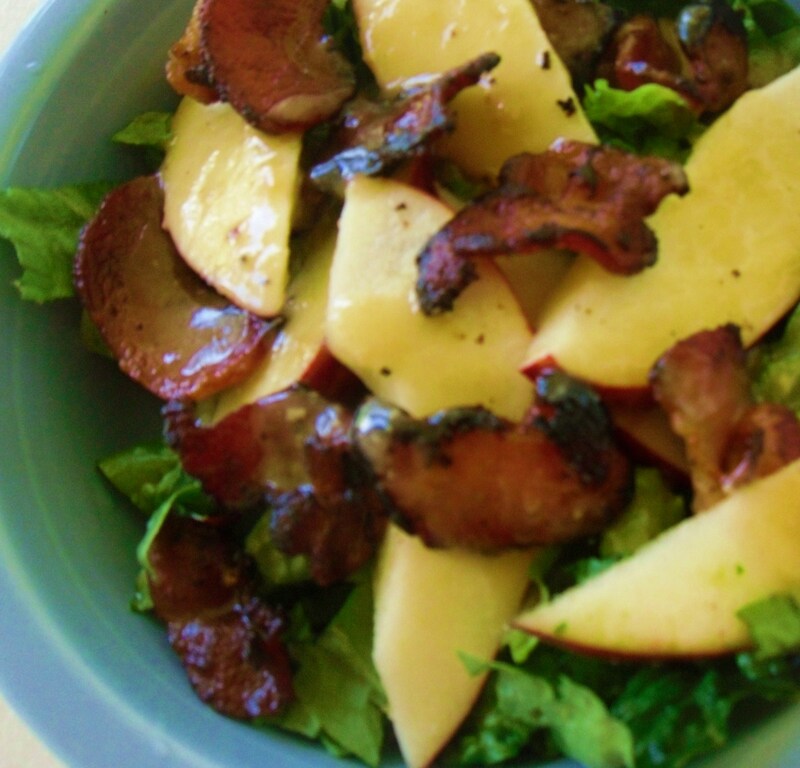 Warm just until brown sugar melts, cool slightly then drizzle desired amount over each salad. Variations: Try this vegan version of baconmade with wide pieces of coconut, liquid smoke, and soy sauce. 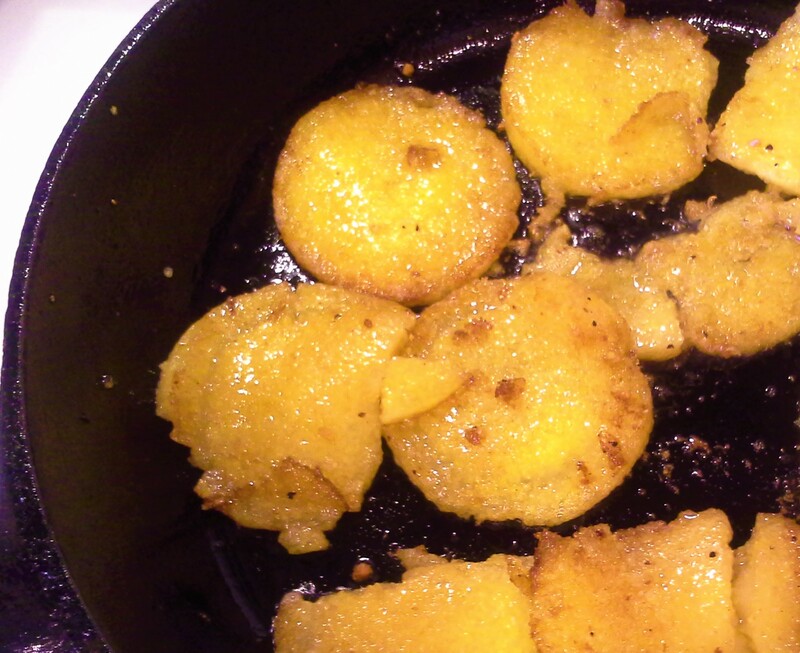 Add avocados, dried fruit or use crisp pears instead.